Desert Botanical Garden in Papago Park in Central Phoenix is not only a botanical garden, but it is also classified as a museum by the American Association of Museums. The garden covers about 50 acres, and in addition to the vast array of native plants on display, the garden is home to over 21,000 plants representing 3,931 plant classifications in 139 plant families. 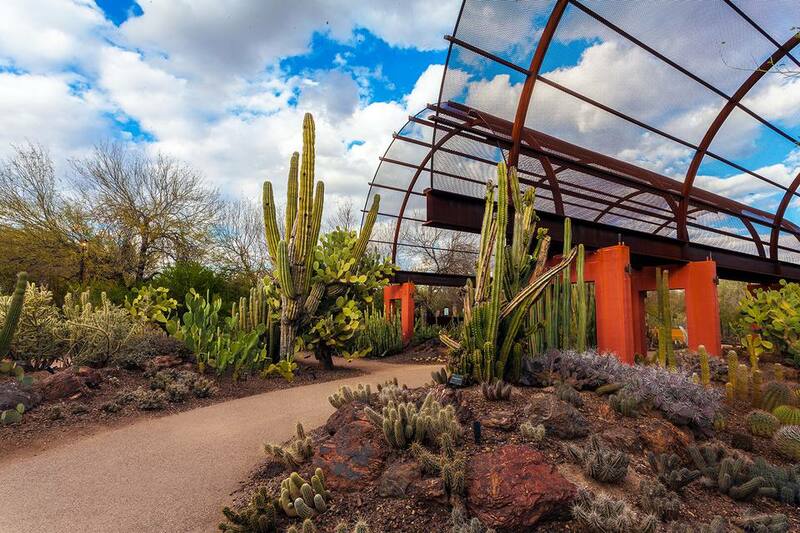 Nationally and internationally renowned for its plant collections, research, and educational programs, Desert Botanical Garden has been operating since 1939. It is a Phoenix Point of Pride. Desert Botanical Garden is a privately funded, non-profit organization and depends on revenues from admissions, programs and gift shop sales, as well as contributions from individuals and businesses. There are six major trails/permanent exhibits to enjoy during your visit. Desert Discovery Trail: This is the garden’s main trail with desert plants from around the world. You'll find the oldest plantings on this 1/3 mile trail, and it is easy to navigate. Don't miss the Sybil B. Harrington Cactus & Succulent Galleries on this trail, with beautifully arranged cacti and succulents from around the world. Plants & People of the Sonoran Desert Trail: This trail will help you understand how the desert dwellers use desert plants for food, construction, tools, and basket-making. There are hands-on activities on this 1/3 mile trail. Harriet K. Maxwell Desert Wildflower Trail: Learn how colorful desert wildflowers, hummingbirds, and bees interact in the Sonoran desert on this 1/3 mile trail. Sonoran Desert Nature Trail: A 1/4-mile trail where you can enjoy the big picture: desert, mountains, plants, and animals. Center for Desert Living: Desert herbs, vegetables and more are growing here. The Sam & Betty Kitchell Family Heritage Garden: New in 2016, this area is home to many of the Garden’s oldest plantings, including the iconic cardones (Pachycereus pringlei) and the creeping devil cactus (Stenocereus eruca). Located within the Kitchell Heritage Garden are two new spaces, the Cardon Plaza and the Fine Family Contemplation Garden. In the spring of 2017, the new Maxine & Jonathan Marshall Butterfly Pavilion opened seasonally, where you can walk among hundreds of North American butterflies. If you want to make sure that you don't miss any important details, there are several docent-led tours offered that are included with your paid admission to the Garden. There are general garden tours, tours that focus on Birds in the Garden, Ask a Gardener sessions and children's programs with hands-on activities. For a small additional charge, the self-guided audio tours offer a new and fun way to enjoy the Garden at your own pace and on your own schedule. A full list of tours and activities is available on their website. Desert Botanical Garden has an incredible variety of classes, workshops, and events to enjoy. There are programs for kids, for adults, and even for professional landscapers, gardeners, artists, and photographers. There are musical events, dinners, art programs, cooking classes, hikes, and camps! In the winter, one of the most popular events, Las Noches de las Luminarias, is held at the Garden. Visit the Desert Botanical Garden official website for more information about scheduled classes and events. Desert Botanical Garden is in Phoenix, near the Phoenix Zoo in Papago Park. It's only about ten minutes from Phoenix Sky Harbor International Airport. Directions: Desert Botanical Garden is near 64th Street and McDowell Road in Phoenix. From the north: Take SR51 south to McDowell Rd exit (Exit 1). Turn left (east) and drive to 64th Street. Right turn (south) on 64th Street. From the north and west: Take I-10 East (toward Tucson) to Loop 202 Red Mountain Freeway East, Exit 147A. Take the 202 to Exit 4, 52nd Street / Van Buren Street. Drive east on Van Buren to Galvin Parkway and turn left. Signs will direct you to the garden. From the south: Take Loop 101 Price Freeway North and then Loop 202 Red Mountain Freeway West. Exit at Priest Road and turn right on Priest, which becomes Galvin Parkway. Signs will direct you to the garden. Via Public Transportation: It is not directly accessible by METRO Light Rail, but the bus will get you there. The bus stops at the intersection of McDowell Rd. and 64th St.from there it is a short walk to the Garden entrance. If you are connecting from Light Rail, get off at the Priest / Washington, station and then take the #56 bus, which first stops at the Phoenix Zoo and then the Garden. Every day except for July 4, Thanksgiving Day and December 25. The Garden opens at 8 a.m. and closes at 8 p.m. In the summer months, it opens at 7 a.m. Some trails close early in the evening. There may be some days when the garden, or a part of the garden, is closed for a special event. One day per month, on the second Tuesday of the month, admission for everyone is free from 8 a.m. to 8 p.m. Some special exhibits may have an additional charge. See their website for current admission rates and to purchase tickets. The Garden also has a cafe, a full-service restaurant (Gertrude's), a reading library, and a wonderful garden shop where you can purchase gifts and live plants. In a wheelchair? You'll enjoy a great deal of the garden even if you stay on the paved and brick paths. In the winter temperatures are cool in the morning and warm during the day. In the summer take advantage of cooler morning temperatures. Wear sunscreen and a hat. Make sure you know the signs of heat exhaustion before you go. It's more common than you think--even for locals! There are public park picnic areas close by, but not at the Desert Botanical Garden itself. You may encounter local, native wildlife. Stay on the trails. A trail map is provided at Admissions. Strollers, scooters, wheelchairs, and umbrellas are available to rent on a first come, first served basis. Arizona State University plays baseball at Phoenix Municipal Stadium (Usually February through May), so you might encounter some traffic congestion and/or detours when there are games at Phoenix Municipal Stadium. The Desert Botanical Garden is a popular place for weddings and other special events and meetings. If you are going with a desire to see any particular exhibit, you should call first to make sure that it isn't closed for any reason. Need advice about a desert plant in your garden? Try the Desert Plant Hotline at 480-481-8120. Monarch Butterflies: They Are Back!